& from Wales / Cymru including Rook End. What were you doing on November 25th, 1996 ? If you weren't speed-dialling London's Virgin Radio station chances are you won't have one of these, let alone all seven. Following the release of their highly anticipated 'Made In Heaven' album the remaining members of Queen, along with Parlophone and Virgin Radio executives, together created a very special series of prizes to chase away any Monday blues and tempt you with some red-hot Queen booty. Throughout the day Virgin Radio played a selection of tracks from the album and determined callers lucky enough to get through and successfully answer a Queen-related question were able to choose one from seven of the Made In Heaven album tracks as a special edition 12" single, housed in a custom Queen Crest logo sleeve. By the end of the day there had been 14 competition winners. 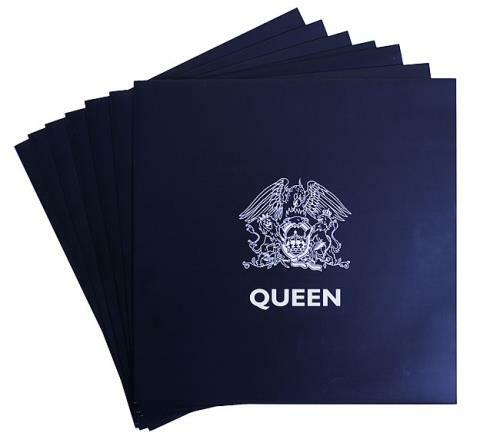 Each winner received their one chosen record and as an added bonus that one record was AUTOGRAPHED by Brian May, Roger Taylor and John Deacon. We've only had two of the actual prize-winners records for sale since 1996. Prizes on the day account for 14 of the 84 records (12 sets of 7 = 84). So, what about the rest? Well, some complete sets were given as a 'thank you' to the radio executives although none of those were autographed. As there really are only 14 individual records that have signatures collating an entire set of all seven with original autographs is as close to impossible as makes no difference. Product Information Queen Virgin Radio Queen Day - The Magnificent Seven UK 12" vinyl single (12 inch record / Maxi-single) Promo.